We take an integrated pest management approach and mark our territory by monitoring, inspecting and preventing a wide variety of seasonal pests from coming in and around your home or place of business. Our licensed exterminator professionals first identify existing pest activity and harborages and treat them accordingly using safe Canadian-regulated products. 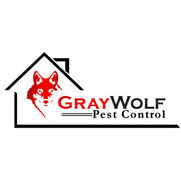 Gray Wolf's exterminators will use the best products available to its maximum potential in areas where insects will be living. Using baits, dusts, liquid residuals, fog treatments and physical pest control to create a treatment plan that will best suit your home or place of business guaranteed!